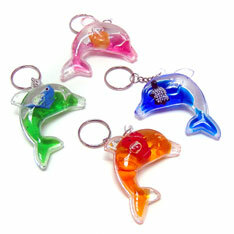 Attractive liquid-filled clear impact plastic dolphin with keychain attached. Liquid assorted colors – pink, orange, blue, and green. Total length is 4 inches. Sold by the dozen. 12 count header card display. $7.05 per dozen for 20 dozen or more. $6.00 per dozen for 40 dozen or more.